DFW Food Storage: Palm Shortening Time Again! With food prices on the rise, we are excited to continue to still offer the organic Palm Shortening at $30.00 per gallon delivered to Texas. This is a great oil for your storage program (see below for more information). Find attached an order form and get your orders in by July 31st. Palm shortening is derived from palm oil. In its natural state, palm oil is a mixture of saturated and unsaturated fatty acids, with most of the unsaturated fat being monounsaturated fat. Palm shortening is palm oil that has some of its unsaturated fats removed, giving it a very firm texture, and high melting point. 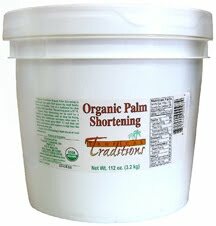 The melting point of our Organic Palm Shortening is 97 degrees F., making it very shelf stable. It is NOT hydrogenised, and contains NO trans fats! It is great for deep-fat frying and baking, and is not prone to rancidity. Since it has been separated from some of the unsaturated portion of the oil, it is colorless and odorless, and will not affect the taste! Although scarcely used in the US any longer, palm oil is the most heavily consumed dietary oil in the world after soybean oil. If one were to exclude the US where most of the world’s soybean oil is consumed, palm oil would be the most popular dietary oil in the world. Palm oil traditionally has been used for baking, shortenings, margarines and deep fat frying, as it is shelf stable with a high melting point and does NOT require hydrogenation. Therefore, it contains no trans fatty acids. Saturated fats, such as tropical oils like palm and coconut, as well as butter, have traditionally been considered healthy fats and oils. In modern history, commercial interests have condemned saturated fats and replaced them in the American diet with polyunsaturated fats that are hydrogenised and contain trans fatty acids, which most people now consider harmful. These trans fatty acids were banned in some European countries as early as 2004, and food label laws in the US just forced manufacturers to list trans fats in their products last year. Some cities in the US are now banning trans fats in restaurants as well. The reason I found the palm shortening was my frustration in having to throw away a bunch of vegetable oil in my storage because it had all gone rancid. I thought that there must be something that would have a longer shelf life, but be healthy (unlike Crisco). That is when I learned about palm shortening. Palm kernel oil is the most widely used cooking oil in the world. However palm kernel oil is a combination of saturated and unsaturated fats. It is the unsaturated fats that have the short shelf life as they are easily oxidized (turn rancid). So the manufacturer takes the palm kernel oil and separates the saturated fat from the unsaturated fat and the saturated fat becomes Palm Shortening. Saturated fats are very stable and do not oxidize (turn rancid) easily if at all. So the palm shortening, if unopened and kept in a dark spot at room temperature has an indefinite shelf life. Once opened it has a 2-3 year shelf life. 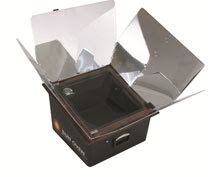 That is perfect for food storage. Besides the shelf stability, palm shortening contains medium chain fatty acids that are anti-bacterial and anti-fungal. The latest research shows that there is no link between the consumption of natural (made by nature) saturated fats and heart disease (research available on request) Palm shortening can be used in any recipe that calls for oil, butter or margarine. It is tasteless so it does not change the flavors of foods and it also has a very high smoke point so it is great for frying. It is the perfect oil for storage. 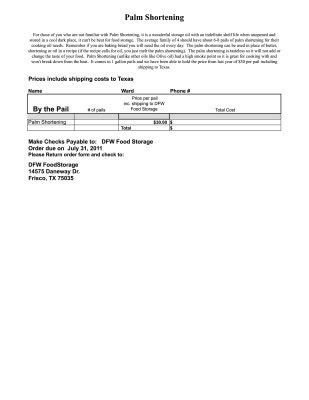 Print out this form to mail in your order. For a quick and easy checkout, you can pay with a credit or debit card or with PayPal. However there is an additional $1.17 credit card processing fee. Click on the button below to place your order online!